I am sharing some of my all-time favorite health and fitness items that would make a perfect gift for that health and wellness loving friend. 02// My Apple Watch is a must wear every day. I love the fitness app. It tracks not only your daily works out but also any movements of the day. If I am busy working at my computer it will remind me to get up and move. I also love how you get a weekly report of your activity. It makes me strive to be more active day to day. Oh, and also the find my phone button is a lifesaver! I can push a button on my watch and it will sound an alarm on my phone to help me track where I last sat it. 04// I’m obsessing over this gym bag (here too). I know lots of girls head straight to the gym post work and need a place to throw all their workout gear. This would be the perfect gift idea. Other great options here, here and here. 09// This book completely changed the way I eat. It really showed me what our body needs and how to fuel it with the right foods. 10// & 12// These sports bra’s and leggings are cut from fabric made from recycled water bottles. If you’ve been following me on Instagram you know how much I love this brand. Their products have the best feel and fit! We’re teaming up with Girlfriend Collective to give away a pair of their leggings and sports bra. I follow on Insta (@collifornia) & subscribe! @kimberly.merriman. That’s my insta handle!! 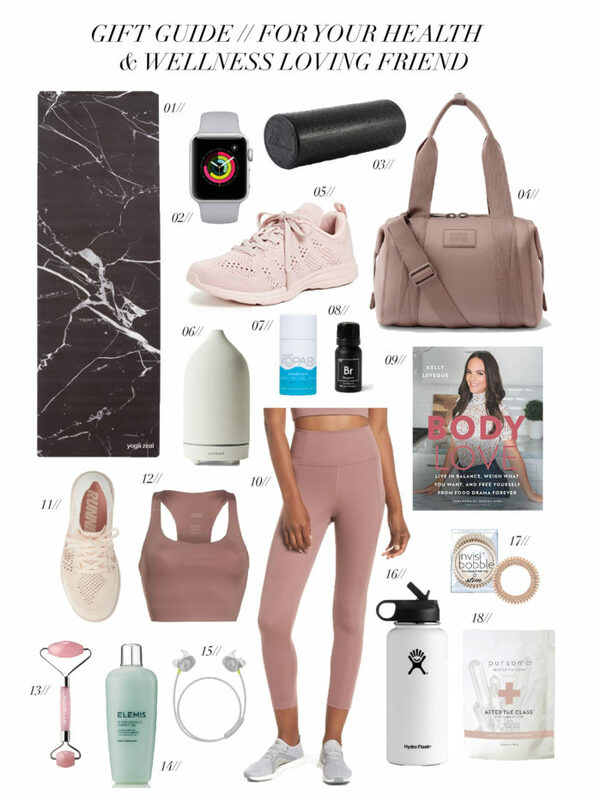 I’m dying to try the girlfriend collective workout clothes!! @blakecarnes. Love love love this gift guide! Love these health and wellness picks! I recently had my Fitbit stolen going through TSA! Debating the Apple Watch 4 or the newest Fitbit, so I appreciate your feedback! I’m skeptical about the short battery life…. how often / when do you charge yours? I’m interested in sleep insights, do you wear yours at night? Oh man, sorry to hear that! I love my Apple Watch! I charge mine every night, so I don’t wear it when I sleep. But I think I could go about 36 hours on 1 charge. @momolaude. I have already been receiving your newsletter for a couple years and love it! Thanks for having this giveaway! @meganjade is my insta and I subscribe! Ask I love love love the Girlfriend Collective and have been DYING to try the sports bra!! So excited for more of your gift guides! They are the best! My Instagram is karley.gosselin! LOVE THIS HOLIDAY GIFT GUIDE!! Will be getting many of the things for myself and for the other positive women in my life!! @ajenki Always love your gift guides!! Ohhh I love the sports bra & leggings!! That gym bag is super cute too. And, every girl needs a facial roller – great suggestion! Such great picks as always!! I’ve got a number of friends & fam who would love so many of the items! @vanessavadams. I would love to get this gift. I just had a baby and trying to get back in shape. This would help out. @vanessavadams I would love to win this gift. I just had a baby and it would help me get back in shape. I love this gift guide! I would also love to try out this collection! They have such pretty pieces! Such a great gift guide! I would love to try this collection! They have such pretty pieces! Love these pics, definitely inspired my christmas wish list!